Camellias Japonica and other Camellia varieties are some the most popular shrubs used in landscaping home grounds on the Pacific Coast and in the southeastern states. Due to the normally mild climate of this area it is possible to grow all but the most tender varieties, and even in the most severe winter on record, when temperatures dipped as low as 15 degrees below zero, established plants came through much better than had been anticipated. In fact, they withstood the cold weather equally as well as many other shrubs that are considered a great deal hardier. Nearly all of the larger camellia japonica varieties came through with the loss of only part of the foliage and, in some instances, with damage to the buds. Much of the increased interest in camellias has been due to the many improved varieties now readily available from commercial growers. Their lustrous evergreen foliage, makes them a desirable addition to the landscape even when not in bloom – another feature that has attracted gardeners. As different varieties have different habits of growth, camellias can be used for almost any type of landscaping. Some gardeners are developing camellia hedges, others use the plants for formal plantings or as accents with existing shrubbery, and still others are espaliering them for attractive effects. The blossom colors range from white through varying shades of pink and red. They are not only beautiful on the plant but also in arrangements. Then, too, the wide range of flower types offers the gardener almost unlimited selection. Other factors which have entered into the increase in popularity of this shrub are its ease of growth and comparative freedom from diseases and insects. 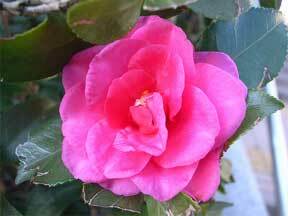 Camellias which are properly planted and given adequate drainage and an acid soil require very little attention. Camellias do best in soil that has a pH of between 5 and 6. Most soil in the western portion of the Pacific Northwest is inclined to be acid, but should it be on the alkaline side the situation can be corrected by adding sulphur or aluminum sulphate to the soil at planting time and using acid-type fertilizers when extra nourishment is needed. Not only should the soil be acid, but as in the case of almost any shrub it should be fertile and have an adequate supply of humus. The ideal soil mixture should be one composed of 1/2 garden soil, 1/4 humus and l/4 sand. When planting camellias it is well to dig a hole large enough to allow a good amount of soil, sand and humus to be filled in around the root ball. Another precaution in planting is to see that the shrub has good drainage. Except under adverse conditions, this can easily be accomplished by putting a 3- or 4-inch layer of gravel or rock under the soil on which the root ball will rest. As camellias are surface feeders, care should be taken when planting to make sure that after the root ball has settled, the top will be no lower than the surface of the surrounding area and preferably slightly above.